MORE than 15 months of organisation went into yesterday's official channel opening in memory of iconic marine pilot Dudley Jacobs. The Fantasy Dreamer took more than 70 guests to the western side of Curtis Island to witness two tugboats christen Jacobs Channel. Region harbour master John Fallon said the channel, previously known as the LNG access pathway, was a fitting tribute to the late Mr Jacobs. 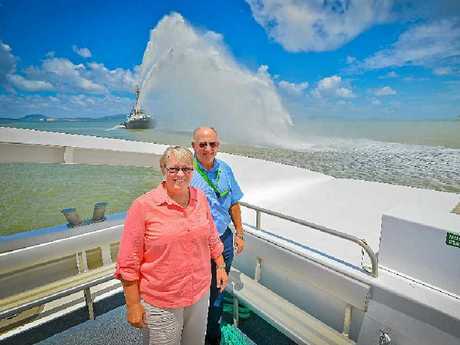 "It's been a long time coming in conjunction with Maritime Queensland, the government and then Cabinet's approval, but Dudley would be proud," he said. "My predecessor Mike Lutz came up with the idea not long after Dudley's death, and ever since there's been great support for it from Gail Sellers, Liz Cunningham and all the public." 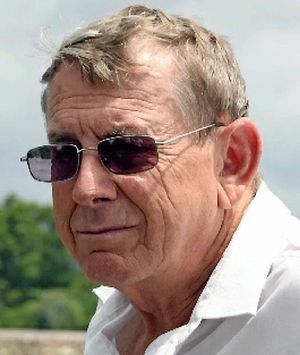 It has been three years since Mr Jacobs died when a tugboat sank in Gladstone harbour. In a 30-year career, Captain Jacobs served as a marine pilot with Maritime Safety Queensland in several ports, including Gladstone for 22 years where he was also a member of the yacht club. He has been labelled an iconic part of Gladstone's marine history, and it is for this reason that a rare renaming of a channel has occurred. Mr Jacobs's wife Lynne Campbell and daughter Sarah Jacobs were on-board for the ceremony and said they were thrilled with the memorial. "Dudley would most certainly be proud; proud of the channel, his colleagues, and today," Ms Campbell said. "We lived here for 30 years together and a large portion of his life was spent out on the Gladstone waters. "I'm still involved with the local sailing club so I'll be visiting the channel often and thinking about him always." A memorial plaque was also unveiled and will be situated on the JCI 1beacon. The tugboat Adonis was towing a water barge in Gladstone harbour on June 11, 2011 when it rolled and sank. There were four people on board. Water police were able to rescue three men but were unable to locate Mr Jacobs. His body was found the following day.